Hello! Happy Monday! I hope you had a lovely weekend. I recently was going through all of my craft YouTube subscriptions and came across this card with a little African American boy on it and I had to find out where the creator got the stamp. I watched Amy’s video and was pleasantly surprised to see that the stamp used was not really an African American boy but it was how she colored him and his hair that led me to believe it. I do this all the time because I find a shortage of culturally diverse stamps. 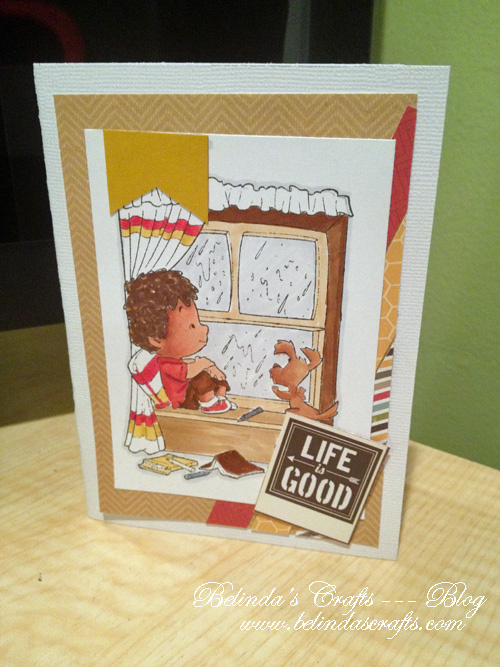 I ordered the stamp (Roberto Rascals Henry’s Rainy Day by CC Designs) quickly grabbed up a paper pack that I had that was very similar in colors and used many of the Copic Colors she used to create my card. I just love this image. I found one more and look forward to coloring it up too. Thanks April! I wish I could take the credit for the color choice but as I said, I scraplifted the idea from Amy’s video. I didn’t have the exact markers or paper pack but I found similar ones and will definitely be using this combo again.